What does Apple Bottoms mean? Apple Bottoms is a brand of jeans founded by hip-hop star Nelly in 2002. 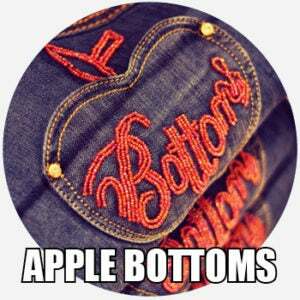 Apple Bottom jeans, as the name suggests, are generally designed for women with full hips. shawty got them apple-bottom jeans but do she got them apple-bottom dreams?? DIY-whiz Erica Domesek's latest boots with fur project has us revisiting Flo-Rida's greatest hit... But these booties are less "Apple Bottom jeans" and more "Alexander Wang hottie." Where does Apple Bottoms come from? With model and DJ Sassy Pandez as its first brand ambassador, Apple Bottoms quickly rose in popularity. Stars such as Fergie, Ashanti, and Melyssa Ford have all been photographed in the jeans, and Oprah included the brand on her favorite things list in 2004. The visibility of the brand in public consciousness can almost certainly be contributed to the popularity of the song “Low” (Flo Rida and T-Pain, 2008), as lookup spikes on Google Trends at its time of release evidences. The chorus of the song includes the lyric, “Shawty had them Apple Bottom jeans.” “Low” dominated the US Singles Top 100 chart for 10 weeks in 2008 and was featured in the movie Step Up 2: The Streets. Even though Apple Bottoms has not run an ad campaign since 2010, the enduring popularity of the song “Low” has kept the brand name alive in public conversation, especially among people who were students during the height of the song’s popularity. “Low” is regularly featured on Spotify users’ “Throwback Thursday” playlists. Social media users use the lyric Apple Bottom jeans in joking allusion to the song “Low” as well as nostalgic commentary on how much time has passed and how much older they have gotten since 2008, e.g., “Getting ‘low low low low low low’ to apple bottom jeans is all well and good until you can’t get back up again,” as one tweeter mused.